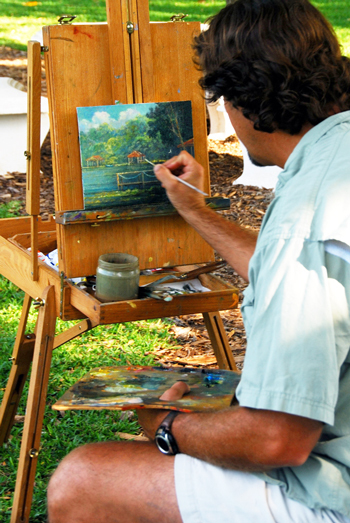 The Winter Park PaintOut, which was based at on the grounds of the beautiful and historic Albin Polasek Museum in Winter Park was a big success for everyone involved. Being the first annual event, it was easily determined by the founders of the paintout that it was the beginning of a new springtime tradition. Every participating artist – over twenty five in all – sold works at the event which help raise much needed funds for the museum. 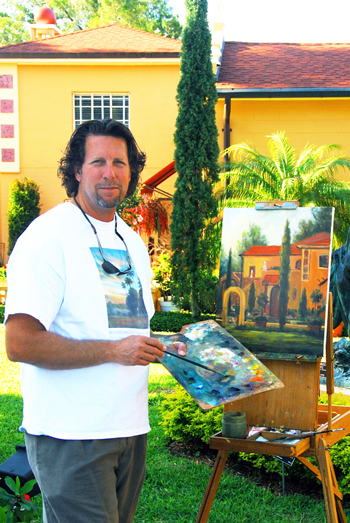 The idea for the paintout was hatched by Hal Stringer and Gary Hollingsworth both of which are heavily involved in the local art community in the Orlando area. This knowledge gave them a large group of gifted painters on which to call upon for the event. “The talent at this event was unparalleled” says Peter Pettegrew who sold three of the four works he created during the event. “Everywhere you looked there were incredible paintings in the works by the best painters of the area.” Several workshops were held during the event to help educate collectors on the different approaches on Plein Air Painting each artist employs, including area great Tom Sadler who gave an interesting demonstration on old masters techniques which drew both collectors and artists alike. The final night of the event was a beautiful evening. Inside the museum, all of the works were on display among a crowd of admirers. Outside among the sculpture gardens, delicious catering, being prepared (and donated) by some of the areas best restaurants was available for collectors to relax and decide which paintings might go home with them that night. Red dots (sold stickers) lined the walls beneath the paintings and everyone involved felt a sense of hope and accomplishment for the event and the support of those who still need art to bring beauty and joy into their lives. You are currently browsing the Peter Pettegrew blog archives for May, 2009.